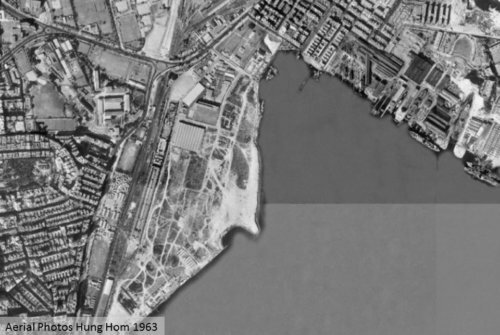 Tymon Mellor: With the end of the Second World War and the growing population of Hong Kong, it was clear that upgrading of the Kowloon – Canton Railway line would be required to accommodate the increase in passenger and freight traffic. 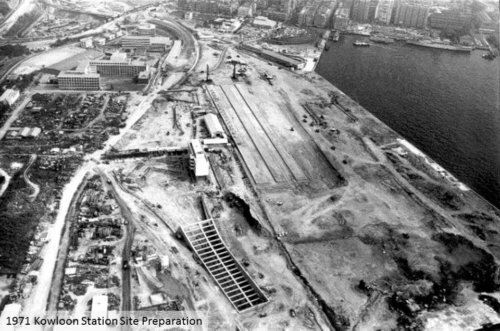 The first priority was to provide a new terminus within Kowloon to accommodate the passenger and freight services. During the 1950s and 1960s, passenger demand outgrew Kowloon Station and overcrowding was a regular problem, particularly during festival periods. Even with passing loops and using all the available rolling stock, overcrowding was common at Kowloon and along the line and there was no spare capacity for growth. Cust Rock, at a meeting with the Director of the Marine Department, it was agreed that reclamation around the Rumsey and Cust Rock would be the best solution for marine traffic, providing sufficient land for the new Cross Harbour Tunnel and the station relocation. 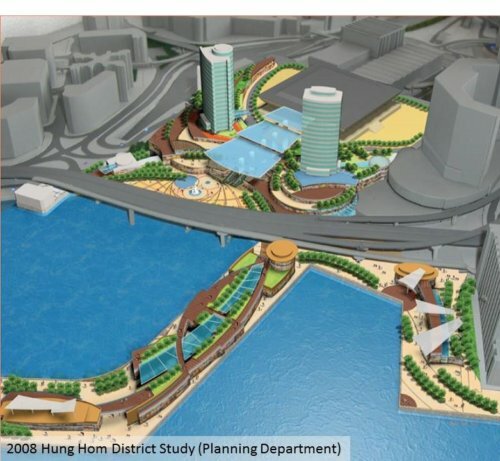 The scheme would be developed in two stages at a total estimated cost of HK$65.4 million. The assessment criteria did not seem to include passenger convenience or accessibility other than for marine craft associated with the freight transport. The key focus was on marine accessibility, as that was where future growth and the financial benefits were forecast. 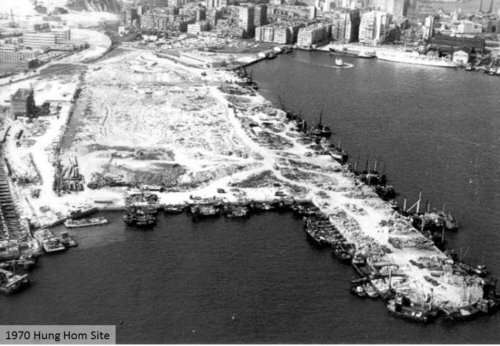 Reclamation of the site commenced in early 1960 and construction of the sea wall in 1962, and was substantially complete by 1966. Around 2 km of sea wall was constructed creating 40 hectares of new land. 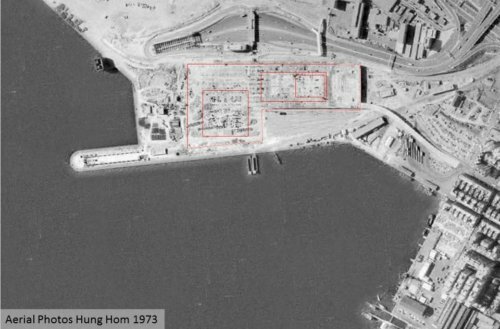 The new land provided the construction site and landing point for the first Cross Harbour Tunnel, which opened in 1972. Details of that project will be covered in a later article. The site was left empty for many years, much to the frustration of many, although it was used for a number of temporary purposes including major fairs in around 1968. 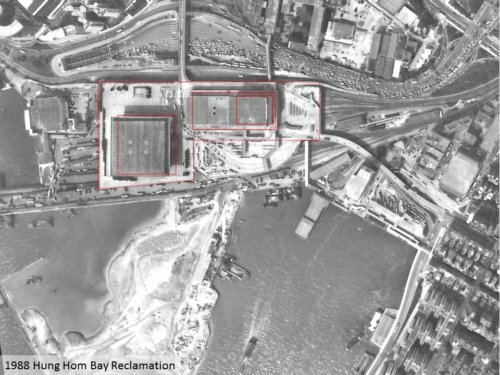 The proposed Cross Harbour Tunnel required a new interchange with Chatham Road occupying the site of the KCR depot. Thus it was necessary to relocate the depot to a new site in the New Territories, ‘Ho Tung Lau’ (named after the successful business family), and to provide some additional maintenance facilities within the Kowloon Station site. 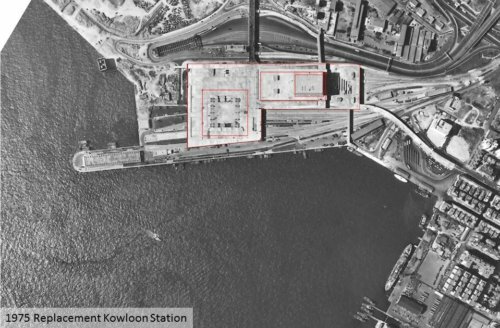 The new Kowloon running shed was constructed at Hung Hom to allow running repairs to be made to the locomotives. This avoided the need to transfer faulty vehicles along the operating lines to the new depot. To connect the facility into the existing tracks, eight kms of new track and 38 new turnouts were installed to connect the new running shed to the Blackhead goods yard. 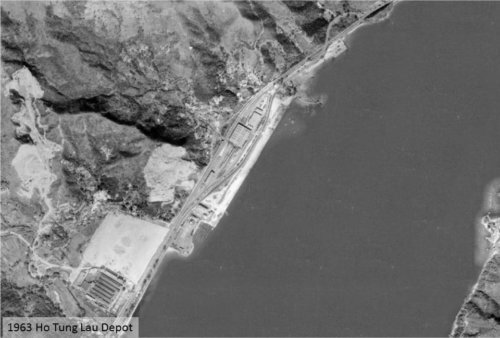 The reclamation of the land for the Ho Tung Lau depot and 600m of sea wall commenced in 1965 allowing building construction to begin, and the new facility was commissioned by 1968. The Ho Tung Lau depot, had a single-storey maintenance shed, stores and offices for inspection, servicing and cleaning of the trains. The facility was later to expand with the upgrading of the line and rolling stock. The facility was further upgraded along with the rest of East Rail along with a phased commercial development above. Planning for the station relocation commenced in 1964 and funding for the works was approved in the financial year 1968 -1969. 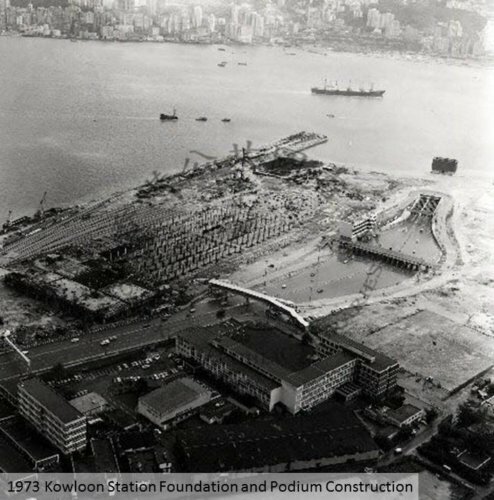 Construction for the new station commenced in 1972, the year the Cross Harbour Tunnel opened to traffic. The new facility occupied 13 hectares and include the Hung Hom public ferry pier, the new station, a freight yard, rolling stock maintenance facilities, a signalling control centre and support infrastructure. The new station had three at-grade platforms serving six tracks, and at the southern end of the station, a traverser was provided to allow locomotives to be removed from the head of the train and run around to the northern end. This facility is still in operation today, but limited to the intercity services tracks and for the movement of the Mainland diesel locomotives. 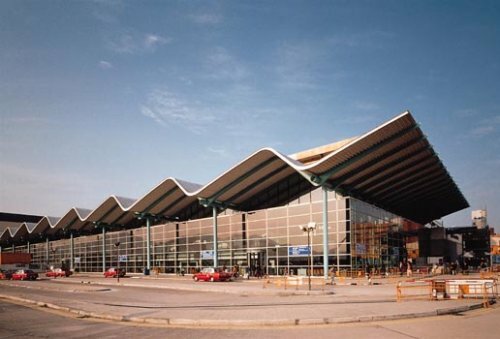 A podium structure above the platform tracks contained the station concourse and passenger transport facilities which included; numerous bus routes, ferry services and taxis. Above the podium was a multi-storey car park, possibly one of the first in Hong Kong. The car park was initially underutilised and the lower levels were converted into a local market for a number of years. 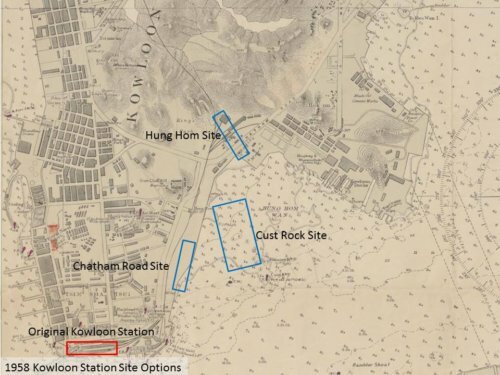 The development included a finger pier for transferring goods to marine transport, and this included a railway transit shed, warehouse facilities and rail vehicle washing shed. Directly above the tracks, an elevated walkway was provided to allow the public to cross the site without having to enter the station. A mid-level walkway was also provided to distribute people from the concourse to the different platforms. Access to the podium was obtained by means of flyovers and bridges serving the ferry and surrounding residential areas. The station was designed to accommodate the future MTR East Kowloon Line and provision was made for an escalator link to the proposed underground station. 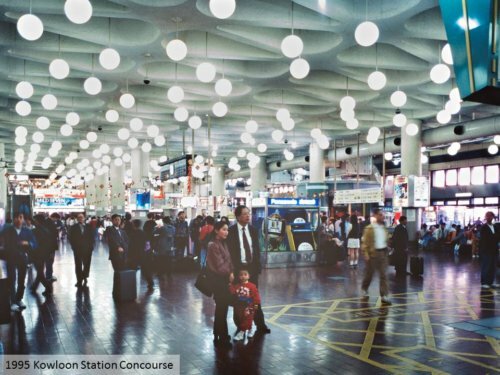 The Podium level concourse was designed to meet the expectations of passengers, in a time when travelling was an experience rather than a necessity. In addition to the expanded ticket hall, the station included waiting rooms, a left luggage centre, toilets, a health office, a lost property office, a book shop and a travel agency. At the south end of the station podium the foundations and substructure were constructed for the future Hong Kong Coliseum, to be constructed after the station opening. The station was designed to accommodate the departure of 30 trains per hour with freight facilities for nearly 400 wagons to accommodate the offloading of 5,000 tons of goods a day. The new facility cost HK$150 million. As with many major projects, the construction ran into numerous problems; including exceptionally heavy rainfall and a shortage of cement, and there were also difficulties in procuring suitable local contractors to tender for the trackwork, so in the end, retired plate layers were recruited for the job. 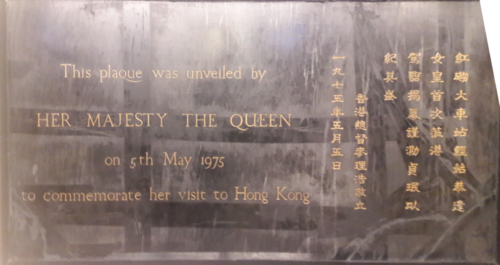 It was planned for Queen Elizabeth II to open the new station during her visit to Hong Kong in May, 1975 but as the station was not ready, she only unveiled a commemorative plaque. The plaque is still on view today, located on the wall of a mid-level walkway between Exit/Entrance A and Exit/Entrance D.
When the station was eventually finished, the opening ceremony was performed on 24 November 1975 by the acting Governor, Sir Denys Roberts, although passenger services did not start using the station until the 30 November 1975 when the first train pulled out at 8:26am. The old station was soon demolished despite an active campaign to save the building. In the end, the old clock tower was retained and is still standing in its original location on the Tsim Sha Tsui water front. The tower was deprived of its one-ton bell, which was put on display in the concourse of the new station in a ceremony which took place on the eve of the Lunar Year of the Dragon – which was deemed particularly auspicious to mark the departure from the old to the new. 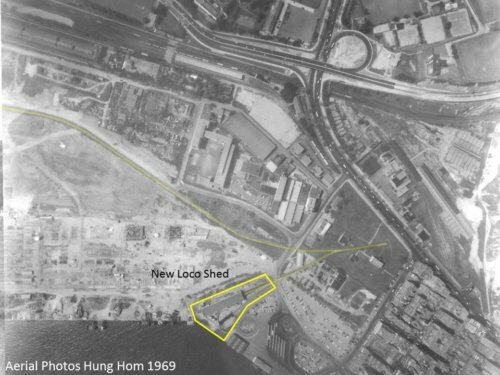 In a short space of time, the track between Tsim Sha Tsui and Hung Hom was dismantled and only a small section was left, known as the Ho Man Tin Siding, which was used for unloading livestock until this facility was relocated to the new Sheung Shui Slaughterhouse. Within a few years of the new station opening, modification and extensions to the facility were undertaken. The station is now a patchwork of schemes as the station has grown to meet changing circumstances. To cope with the growing passenger traffic, the station underwent a refurbishment and podium extension. The podium deck was extended over the freight tracks to provide additional space for vehicular traffic and improved drop off facilities. The station in January 1995. 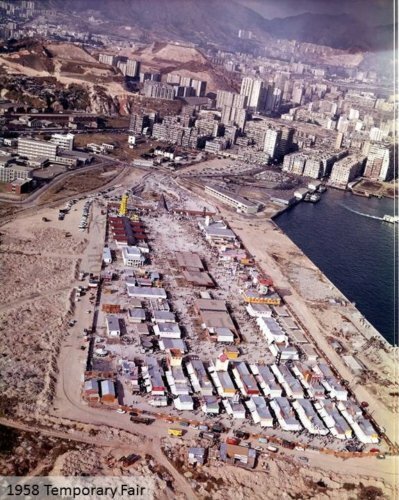 In mid-1986, reclamation of Hung Hom bay commenced, creating 37 hectares of new land with 5 hectares allocated to be used by the KCRC for a new freight yard. The reclamation was completed in 1993 and works commenced on the new freight tracks. 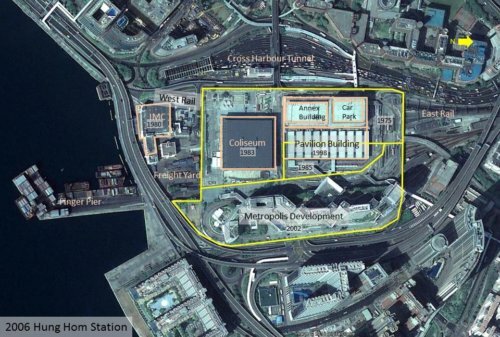 The facility operated as an open site until 1995 when the Freight Yard in-fill project began and the air rights were sold for The Metropolis development to Cheung Kong (Holdings) Ltd. The development was completed in 2002/2003, creating a five-storey retail podium/car park supporting an office tower, a 600-room hotel and two serviced apartment towers. 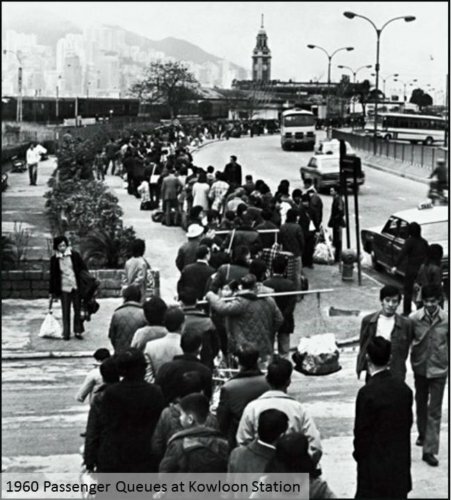 By the late 1980’s passenger numbers had continued to grow as the new towns in the New Territories developed. 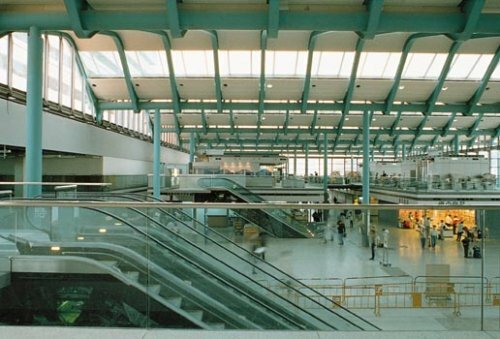 The station had been designed to handle 40,000 passengers a day, but was already coping with 140,000 by the early 1990’s with projections expecting the number to to grow to 200,000 per day. It was clear that the terminus station needed to be expanded to cope with the growing number of users. In 1993, the KCRC held a competition for the design of the station upgrade. The competition was won by Foster and Partners, the architectural firm renown for its designs of the iconic Hongkong and Shanghai Bank Building and the Chek Lap Kok passenger terminal building, supported by sub-consultants Arups and WT Partners. The HK$600 million project involved the complete refurbishment and re-cladding of the existing station and the construction of a new 150m by 45m steel and glass pavilion building to double the size of the concourse. The original intent of the KCRC was just to refurbish the existing structure and add additional immigration requirements. However, Foster recognised that the building would not be large enough and a more radical solution was required. They proposed a new structure with a distinctive wave form roof sitting above the existing railway platforms to provide the necessary space. The works also included the introduction of the mid-level ticket gates and direct platform access from the podium level. Due to the complexity of the works within the operating existing station, a Management Contract approach was adopted with a Hsin Chong / Taylor Woodrow Joint Venture appointed in May 1994 to implement the works. 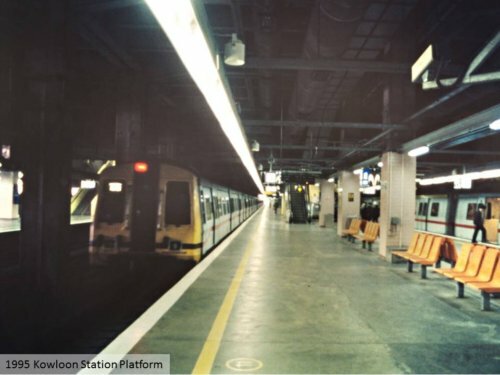 Many problems were experienced during construction, including a lack of drawings showing the construction of the original building and the need to maintain station operations, resulting in the cost of the project increasing to HK$1,500 million and the forecast early 1997 opening being delayed to June 1998. 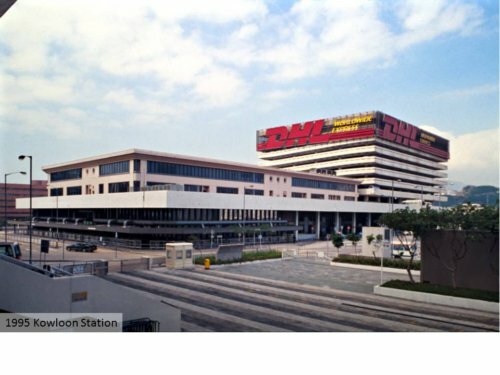 With the relocation of the station in 1975, the station maintained the name of ‘Kowloon Station’. This was later changed to ‘Hung Hom Station’. The date of the change is in some doubt, with Wikipedia advising “around February or March 1996”. 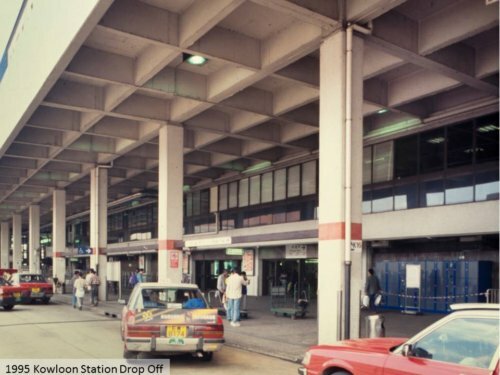 However, the 1994 KCRC annual report adopted the name ‘Kowloon Station’, whereas the 1995 annual report uses the name ‘Hung Hom Station’. There is no mention of changing the station name. 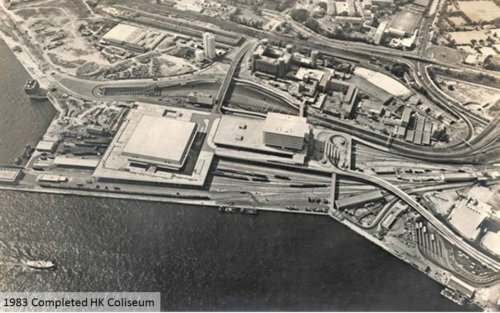 The new station complex included provisions for a new performance venue, the Hong Kong Coliseum. The design of the podium foundations provided for the building above, to be constructed after the station was completed. The Coliseum was designed by the Architectural Services Department to provide seating for 12,500 spectators. As recorded at the time, “An ‘inverted’ pyramid was the reply to an intricate railway track system that ultimately precluded utilisation of multiple column supports”. 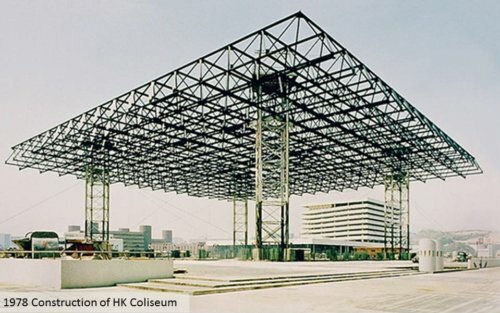 The 100m by 100m space frame roof was initially erected on the podium, then the 1,199 tons of steel was then hoisted up into the air to the required level and the supporting structure erected below. Temporary towers held the roof in place until the permanent supports were completed. Construction of the superstructure commenced in 1976, the year following the railway opening and was completed by 1982. Following the fitting out of the facility, its doors were finally opened on 27 April, 1983. 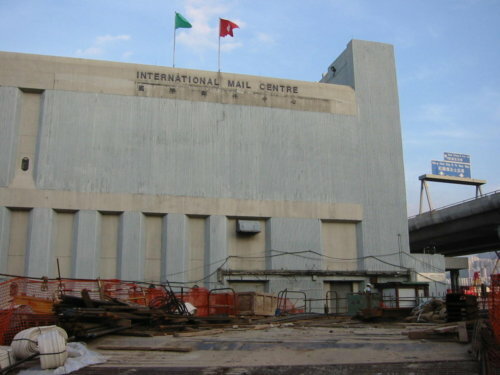 The facility was located at Hung Hom to take advantage of the railway, with a dedicated track and a regular mail train to China, and for 200 mail truck deliveries a day. 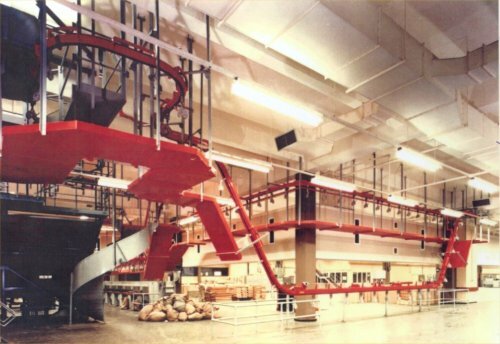 The facility processed 100 tonnes of mail every day (over 1.5 million letters) and operated 24 hours a day, and from July 1990, included a mechanical letter sorting system. As part of the MTR Shatin Central Link currently under construction, the facility was relocated to Kowloon Bay in October 2014, allowing the old building to be demolished to make way for the new cross harbour railway tunnel. The strategy included a new dedicated high speed link to the Mainland dubbed the Regional Express Line, the fourth harbour crossing to Hong Kong Island and the connection of East Rail Line, West Rail Line and the East Kowloon Line. As part of the development, the KCRC brushed off plans for a major redevelopment of the site and the construction of a new office tower to the north of the station, the Millennia Tower. However, discussions with a developer, Cheung Kong Holdings were abandoned in August 2000 when the parties could not reach agreement on the terms. As part of the Shatin to Central Link project, the station is once more undergoing a transformation. Although there are no notable changes to the exterior of the structure, the internal arrangements and station operation are being completely revised. 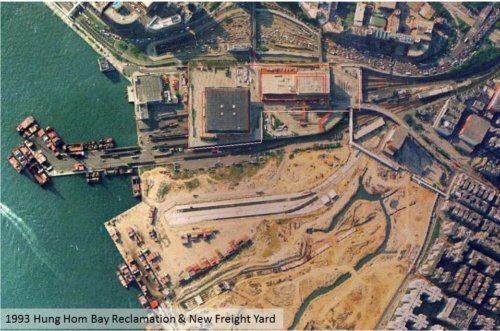 Two new stations servicing the East Rail Line and West Rail Line are under construction within the old freight yard, allowing the East Rail to be extended across the Harbour and West Rail to connect through East Kowloon to the Ma On Shan Line. A new entrance is being constructed to connect the station concourse with the cross harbour bus stops and the mid-level concourse will be removed. This third major reconfiguration of the station will provide the flexibility and capacity to see the station operations through into the foreseeable future. This article was first posted on 14th October 2016. I assume the map you refer to, is the one that accompanied the Sir David J Own report on the Future Control and Development of the Port of Hong Kong Feb 1941. A copy of the map and link to the report can be found here http://www.hkmaps.hk/map_1941.html. The proposal for a freight line along Austin Road and into Whitfield Barracks was never further developed. By the time the studies were undertaken in 1957, it would not have met the Governments requirement of freeing up valuable land for development. It would also not have given a poor arrangement for freight trains with no direct access to wharfage. Freight was to be the future direction for the railway. 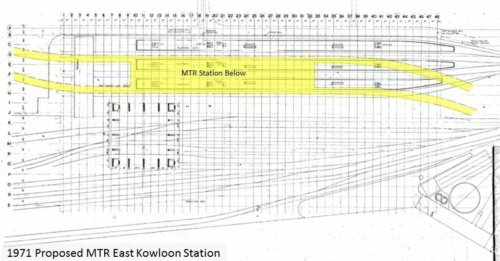 However, the report/map did established the idea of a railway line to Kwun Tong, ultimately addressed with the MTR Kwun Tong Line.